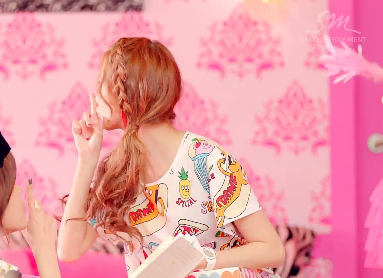 I saw the teaser video for the new SNSD comeback single I Got A Boy and instantly fell in love with Yoona's hairstyle. It was the one at the beginning when she is sat on the bed playing with the phone. Its SUPER simple to do and I think it's such a cute and girly hairstyle. Lovely hairstyle, it reminds me so much of summer.. I wish you only the best in 2013! Cute hairstyle :-) don't think I'd pull it off though! LOL! Such a conscience that I saw the video for this last night - never seen a band with 9 members! I like the hairstyle, wish my hair was longer to do it! loved it!! :D Awesome tutorial as usual! Happy New Years to you gorgeous! I always love your video tutorials!! Please keep posting more for 2013 :D Could u one day do a tutorial for light coloured brows?